What's happening at the Libraries: News, events, workshops, resources, research advice and more! Columbia Libraries holds many millions of digital items in over 300 computer file formats, content that includes digitized reproductions of papyri and clay tablets, manuscripts, archival photographs, historical publications, artworks, sound recordings, film, video, and three-dimensional objects, as well as archival material from statesmen, politicians, and philanthropic organizations such as the Ford and Carnegie foundations. Our digital collections are expanding rapidly as a result of new acquisitions of content originating in digital format, and our ongoing digitization of unique cultural heritage materials from new and existing archival and specialized collections continues. On our website, you can view a portion of our preserved digital collections that we have published for open use, such as the Columbia Spectator Archive, the papers of composer Ulysses Kay, and the holdings of sixteenth-century Italian architect and theoretician, Sebastiano Serlio. This entry was posted in Events and Exhibits, Featured E-Resources, News and tagged Columbia Spectator, digital preservation, Sebastiano Serlio, Ulysses Kay, World Digital Preservation Day on November 29, 2018 by Allison. History Lab and Columbia University Libraries are pleased to announce that a new grant of $407,000 from Arcadia, a charitable fund of Lisbet Rausing and Peter Baldwin. The grant will enable History Lab to partner with Columbia Libraries to continue building the Freedom of Information Archive (FOIA), which is already the world’s largest database of declassified documents. The FOIA Archive was created to help researchers, journalists, and private citizens explore the ever-expanding universe of electronic records with state-of-the-art tools developed using data science. It now includes more than three million documents from seven different collections. No less important, it features unique metadata derived from techniques like topic modeling and named-entity recognition. Arcadia support will allow Columbia to continue growing the archive, preserve it permanently, and keep it freely accessible for the entire world. In the first year, Arcadia support will help revamp the History Lab’s Application Programming Interface so researchers have direct access to the data, which will soon include hundreds of thousands of new documents recently made available by the Central Intelligence Agency. There will also be a new web interface developed with the help of Columbia Libraries, with a launch date set for June 2020. Columbia’s Vice Provost and University Librarian, Ann Thornton, will appoint an advisory board of stakeholders and partners. Arcadia is a charitable fund of Lisbet Rausing and Peter Baldwin. It supports charities and scholarly institutions that preserve cultural heritage and the environment. Arcadia also supports projects that promote open access and all of its awards are granted on the condition that any materials produced are made available for free online. Since 2002, Arcadia has awarded more than $500 million to projects around the world. History Lab also recently received a $150,000 grant from the American Council of Learned Societies to further extend the reach of the FOIA Archive and train scholars in how to use it. It has also benefited from grants obtained from the MacArthur Foundation, the National Science Foundation, the Brown Institute for Media Innovation, and Columbia’s Global Policy Initiative. This entry was posted in News on September 12, 2018 by Allison. The GRAMMY Museum® Grant Program announced this week that $200,000 in grants will be awarded to 14 recipients in the United States and Canada to help facilitate a range of research on a variety of subjects, as well as support a number of archiving and preservation programs. Among this year’s recipients, Columbia University Libraries will be awarded $20,000 to digitize and preserve 400 hours of unique recordings of early electro-acoustic music from the archives of the Columbia-Princeton Electronic Music Center (CPEMC). The digital copies will meet international standards of capture at 96kHz/24 bit, will be preserved in a long-term archive, and will be made accessible in the Gabe M. Wiener Music & Arts Library. Generously funded by the Recording Academy, the GRAMMY MUSEUM Grant Program provides funding annually to organizations and individuals to support efforts that advance the archiving and preservation of the recorded sound heritage of the Americas for future generations, in addition to research projects related to the impact of music on the human condition. In 2008, the Grant Program expanded its categories to include assistance grants for individuals and small to mid-sized organizations to aid collections held by individuals and organizations that may not have access to the expertise needed to create a preservation plan. The assistance planning process, which may include inventorying and stabilizing a collection, articulates the steps to be taken to ultimately archive recorded sound materials for future generations. The deadline each year for submitting letters of inquiry to the Grant Program is Oct. 15. Guidelines and the letter of inquiry form for the 2019 cycle are available at www.grammymuseum.org. This entry was posted in News and tagged electro-acoustic music, GRAMMY Museum, GRAMMY Museum Grant Program, grants, Music & Arts Library on June 15, 2018 by Allison. Great news! Barnard’s new Milstein Teaching and Learning Center opens in September 2018. Because moving presents some logistical challenges, including restoring books and archival materials to their shelves and the library catalog, the Barnard Library will suspend access to some services and resources for a time this summer. 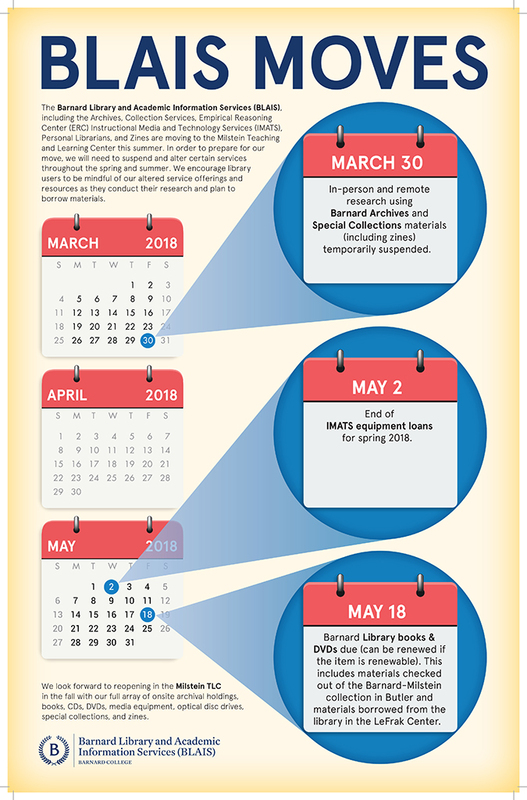 If you are a Barnard library user, please familiarize yourself with these key dates between May and September. This entry was posted in Hours, News, Using the Libraries and tagged Barnard Archives, Barnard College, Barnard Library, Milstein Teaching and Learning Center on May 3, 2018 by Allison. The Council on Library and Information Resources (CLIR) today announced that Columbia University Libraries has been awarded a Recordings at Risk grant to support the digitization of the recently acquired Bob Fass collection. 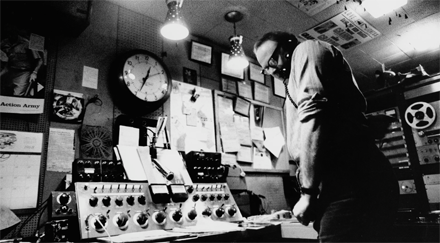 Bob Fass, pictured here in his New York City-based WBAI studio. Courtesy of Lost Footage Films. Columbia will preserve and provide access to almost two decades’ worth of audiotapes from the archive of groundbreaking broadcaster Bob Fass. A pioneer of “free form” radio for seven decades, Fass is best known for his late-night program Radio Unnameable. During the sixties it featured unscripted appearances by poets and musicians like Allen Ginsberg and Bob Dylan, and social activists like Abbie Hoffman and Timothy Leary – a forum where listeners could interact with their idols and one another. In 1968 alone, Fass broadcast live events like the “Yip In” at Grand Central Station, Columbia University student protests, and the Chicago Democratic National convention. Once digitized, these recordings will be a major resource to study mobilization of dissent via mass-media in late-twentieth century America. Recordings at Risk is a national regranting program that supports the preservation of rare and unique audio and audiovisual content of high scholarly value. Generously funded by The Andrew W. Mellon Foundation, Recordings at Risk will award a total of $2.3 million between January 2017 and April 2019. This entry was posted in News on April 27, 2018 by Allison. The country’s largest offsite library shelving facility, the Research Collections and Preservation Consortium (ReCAP), now holds over 15 million items. ReCAP’s 15 millionth item, “Object lessons & the formation of knowledge : the University of Michigan museums, libraries, & collections 1817-2017,” was accessioned April 27, 2018. In September, the consortium members launched a Shared Collection Initiative, expanding Columbia’s catalog by 7 million records. Columbia faculty, students, and staff now have access to the expanded collection through the Columbia catalog, CLIO. Users can locate additional items in CLIO and request direct delivery to campus. Ed Cleary (right) and Ian Acker (left), ReCAP staff members, accession the 15th million item, Object lessons & the formation of knowledge : the University of Michigan museums, libraries, & collections 1817-2017. ReCAP was created in 2000 to support its members’ goals of preserving their library and archival collections and providing access to researchers. ReCAP consists of a preservation repository and resource sharing services, jointly owned and operated by Columbia University, the NYPL, and Princeton, and located on Princeton’s Forrestal Campus. More than 15 million items are currently in ReCAP’s care and used to fulfill approximately 250,000 requests for materials each year, from its partners and from libraries around the world. This entry was posted in News, Using the Libraries on April 27, 2018 by Allison. Stressed? The Libraries are here to help! 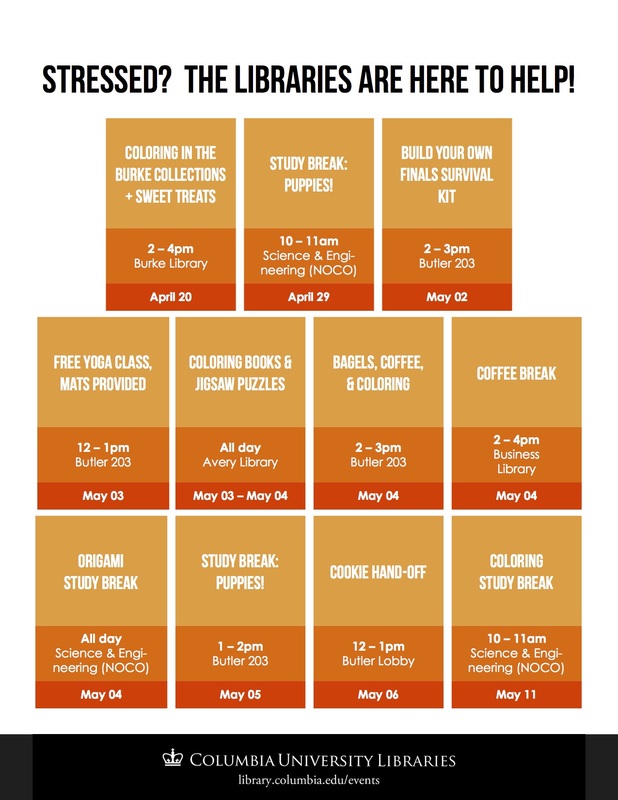 Join us for any or all of our stress-relief activities. No RSVP required! This entry was posted in Uncategorized on April 14, 2016 by Allison. 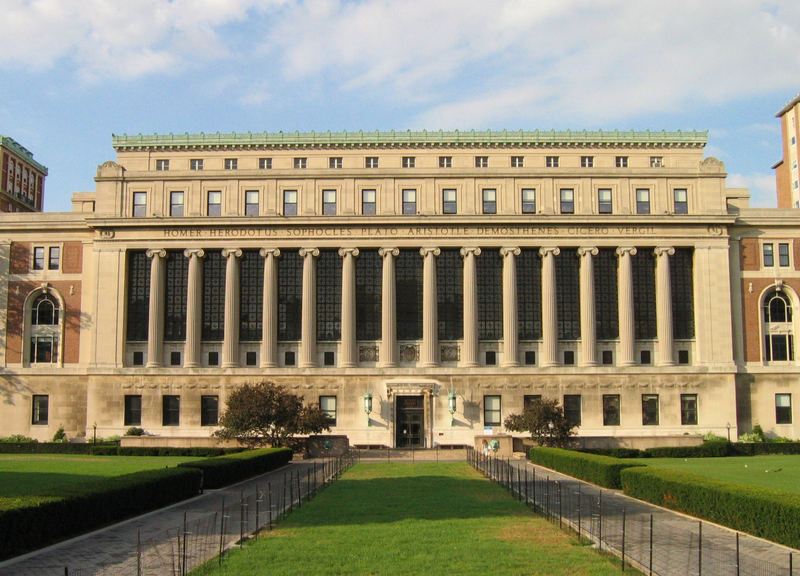 Welcome to Columbia University Libraries! We are happy to offer several tours of our various library spaces during the first few weeks of classes. (For information about ALL library locations, please visit our locations page). **All tours meet in Butler Library lobby near the security desk at 4pm. Sign up here, or show up in person. Tours open to all students. Tours last 45 minutes; limited to 15 people/tour; sign-up sheets at the Avery Library Service Desk. Tours meet at the Service Desk. Tours open to all students. Tours meet at the Service Desk. Available in English, Chinese, Japanese, Korean, Tibetan. This entry was posted in Uncategorized on September 8, 2015 by Allison. The Libraries have partnered with the Columbia College Student Council (CCSC) and General Studies Student Council (GSSC) to provide loans of commonly-used laptop chargers. CCSC and GSCC purchased six laptop chargers available for check-out from the Butler Library Reserves desk (208 Butler Library). These chargers are available for four-hour loans to students, faculty, and staff who have forgotten their laptop chargers. This is a pilot program that will run through the 2014-2015 academic year. “The Libraries are delighted to partner with CCSC and GSSC to provide lending of commonly used Mac, Toshiba, and Dell laptop chargers,” said Francie Mrkich, Director of Access Services. CCSC At Large Representative to Academic Affairs Grayson Warrick adds, “We hope that with this program, we can save time and hassle for students who may forget to bring their chargers to Butler. For a complete list of chargers available, see Laptop Chargers Loan Pilot Program on the Libraries website. This entry was posted in Uncategorized on December 1, 2014 by Allison. Columbia University Libraries / Information Systems is pleased to announce the beta launch of our new Digital Library Collections website. The new site combines into one platform the digital content and metadata from many of our digital special collections projects and online exhibitions. Until now, all of our digital projects’ content has been managed within separate, standalone web/database applications and discoverable only in that context. In the new system, our digital content may be viewed project-by-project or by using a keyword search across all available projects. The new site will also allow us to integrate streaming video and audio into the content. In the future we expect our Digital Library Collections also to be discoverable within the Columbia’s aggregated CLIO search system as well as from the Digital Public Library of America. This entry was posted in Uncategorized on October 27, 2014 by Allison.